Make the most of summer plums with desserts like a fluffy custard and Jacques Pépin's favorite tart. 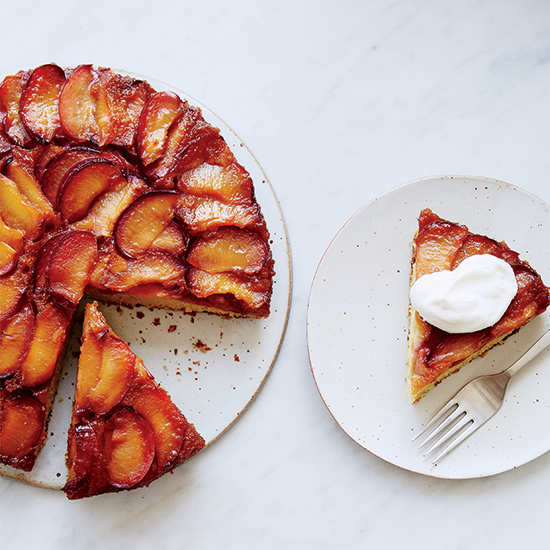 Sweet and tangy caramelized plums top this beautiful cake from pastry chef Joanne Chang. This airy custard is summer's answer to crème brûlée. Sautéeing plums in Chambord — a black raspberry liqueur — gives the succulent fruit even more sweetness and a slightly boozy edge. For a fast and healthy dessert, soak small plums and raspberries in Japanese plum wine with ground ginger. Any firm-but-ripe plums will work for this elegant tart. This simple summer dessert requires just five ingredients, plus water. Jacques Pépin's gorgeous tart features buttery, flaky dough that comes together in 10 seconds in a food processor. These beautiful, rustic tarts can easily be made ahead of time. Juicy baked plums are topped with buttery anisette toast crumbs in this fast dessert. Chef Alex Roberts's moist cake is best with just-picked plums, but it can also be made with other seasonal fruit like cherries or apricots. This fantastic cobbler is a great way to use an abundance of summer plums.